In 2011 the USDA stopped publishing its animal research statistics on the Animal and Plant Health Inspection Service (APHIS) website (with the last full stats being 2010). 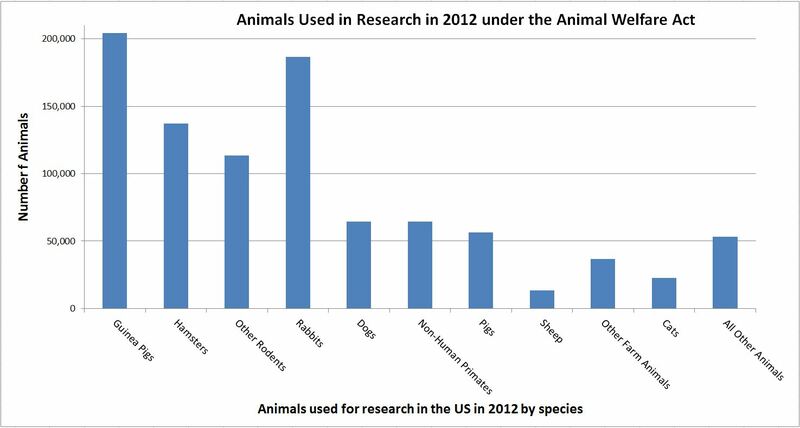 We have recently received the 2012 statistics for animals used in research under the Animal Welfare Act. Overall the number of animals used in research fell by 16% since 2010, falling over 180,000 from over 1.1 million (2010) to just over 950,000 (2012). These statistics do not include all animals as most mice, rats, and fish are not covered by the Animal Welfare Act – though they are still covered by other regulations that protect animal welfare. We can see that rodents (guinea pigs, hamsters and other rodents) and rabbits together account for 67.3% of all research animals, with cats, dogs and primates accounting for 16% of research. In the UK, where mice, rats, fish and birds are counted in the annual statistics, over 98% of research is on rodents, birds and fish. Across the EU, which measures animal use slightly differently, 93% of research is on species not counted under the Animal Welfare Act. We would expect similar patterns to be true in the US – although there are no statistics to confirm this. If we look at the changes between the 2010 and 2012 statistics we can see a drop in the number of animals of most species between 2010 and 2012, with only pigs and cats going against the trend. Most notably the number of non-human primates has fallen by 9.5%, with an even larger drop in the number of rabbits (11.1% drop). It is unclear whether the 16% drop represents a clear downward trend for the numbers of animals used in research, or is simply annual variability, though it would fit in a general downward trend in the US statistics since the mid 1980s. It is also likely that, similar to the UK, a move towards using more genetically altered mice has reduce the numbers of other animals used (those counted by the USDA under the Animal Welfare Act). Posted on February 17, 2014 February 18, 2014 by EditorPosted in News, Science News, SR NewsTagged anima research statistics 2012, animal research statistics 2012, animal research us 2012, animal testing us 2012, animal welfare act, US animal research statistics, US animal testing statistics. Thank you for your articles, including this one. The contribution that scientists make in animal research has undoubtedly saved millions of humans from suffering and/or dying. Humans need to take responsibility for their own health by testing new experiments on humans. It is ridiculous to continue testing the same products over and over every year on innocent animals which feel pain just as humans feel pain. And NO!, I am not a friend of PETA! Cam. Anti-societal much? You say you are not a friend of PeTA, and yet you are regurgitating their propaganda! And yes, I believe in human exceptionalism (as explained very well by Wesley Smith). That is reflected in our society, and it does include our stewardship of the animals we own and care for. “Animal rights” is a cult-like sociopathic belief system, and Peter Singer is one of its most disgusting proponents.